Breakfast in the dining room was magnificent, just like the hotel. There was an ample buffet that had various meats and cheeses along with many kinds of fruit and good scrambled eggs. Even though we knew we were going to be in town the entire day, we still took some oranges and rolls with us — just couldn’t help it, I guess. While eating we discussed the suggestion in the Brierley guide book, to consider taking the bus tomorrow to La Virgen del Camino, the first little town at the outskirts of Leon, principally for the same reasons we took the bus coming in — all industrial area with nothing but hardscape and dangerous traffic all the way. On the way back to the room after breakfast, I asked the desk clerk where we could catch the bus. She showed me on the map where the stop was to get the right bus, and that was very helpful. 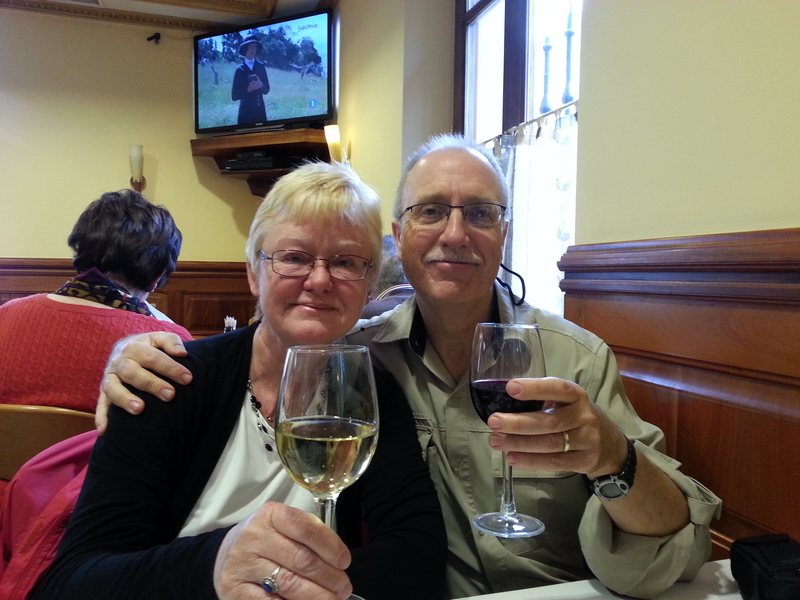 Greg and I then set out to the Plaza San Domingo to find that bus stop so we didn’t have to search in the morning. We were certainly glad we did this because the Plaza had several spokes that spread out in all directions. 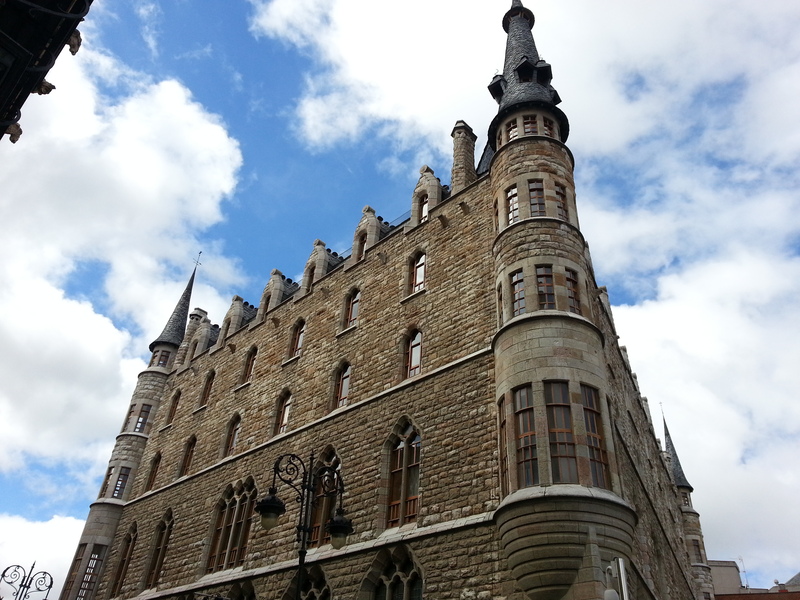 But we were able to find the appropriate stop and set out to do some sightseeing. We discovered that the bus stop was not far from the Casa Botines, a beautiful Gaudi architectural masterpiece where we hoped to encounter the statue of the man himself. Two blocks later we turned the corner and there it was! As I contemplated this intriguing work, I remembered my week in Barcelona about 40 years ago where I first encountered the works of Gaudi, especially the splendid Catedral de Sagrada Familia. 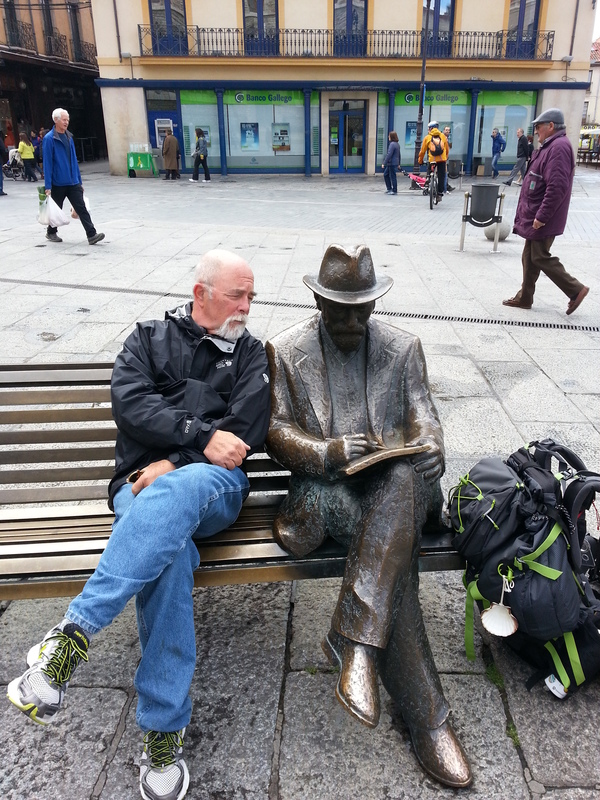 At a bench at the front of the building, I sat down with the artist and reviewed his sketch pad with him. 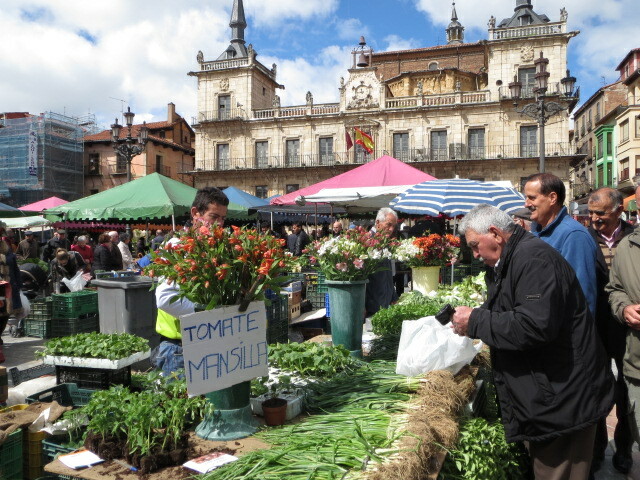 From Casa Botines, it was a short walk to Plaza Mayor where there was a marvelous open-air market in full swing. 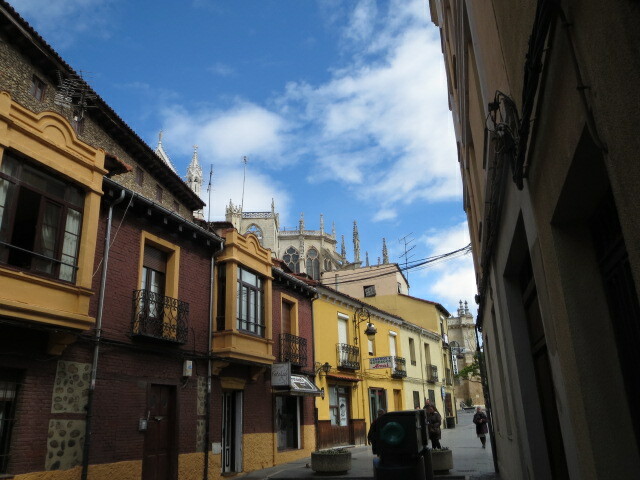 From here it was just a few short blocks to Plaza Regla and the wonderful Gothic spendor of the Leon Cathedral. 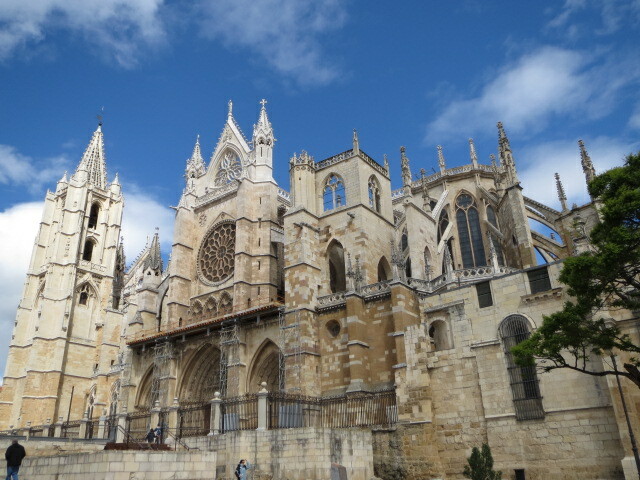 This was one of the first cathedrals to be opened up with stained glass windows that reached to the highest points. 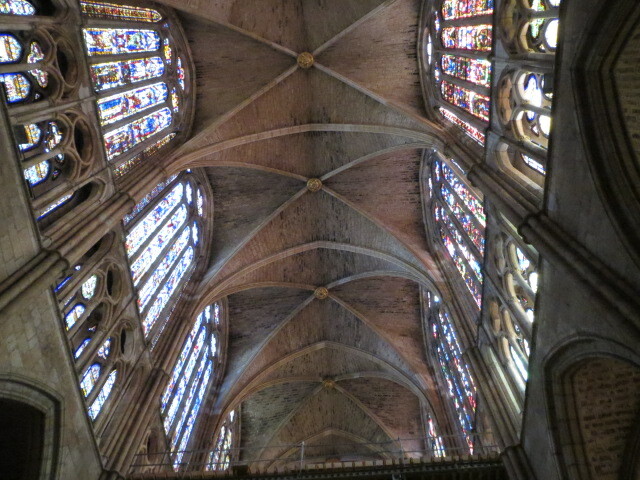 At the top of the windows were the representations of the Holy Trinity and below them were all creation, flora and fauna. 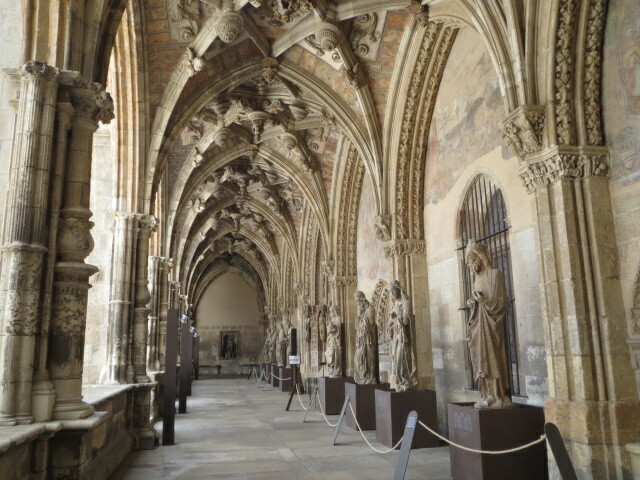 We spent approximately two hours touring the inside of this wonderful 13th century structure along with the cloisters that are adjacent. Winding our way through the narrow streets outside the Cathedral, we arrived back at Plaza Isadoro, just in time to get a pizza at Boccalino. Why not? I checked my phone at the restaurant and saw an email from Sandra indicating that they were in town, staying at a hotel near the Plaza Mayor and that she and Cynthia would be happy to meet us for dinner later in the day. I emailed back that Boccalino was a great spot to eat and that they served full meals any time of the day. Sandra said she was waiting to get something from her husband so they would not be able to meet us until 7. Greg and I agreed that this was a good time and so we set the time for seven. After the pizza, it was time to go back and get a nap in. Later, we ascertained that this was much needed rest on these “days off”. We arrived at the restaurant just before seven and got a table to wait for our Canadians. 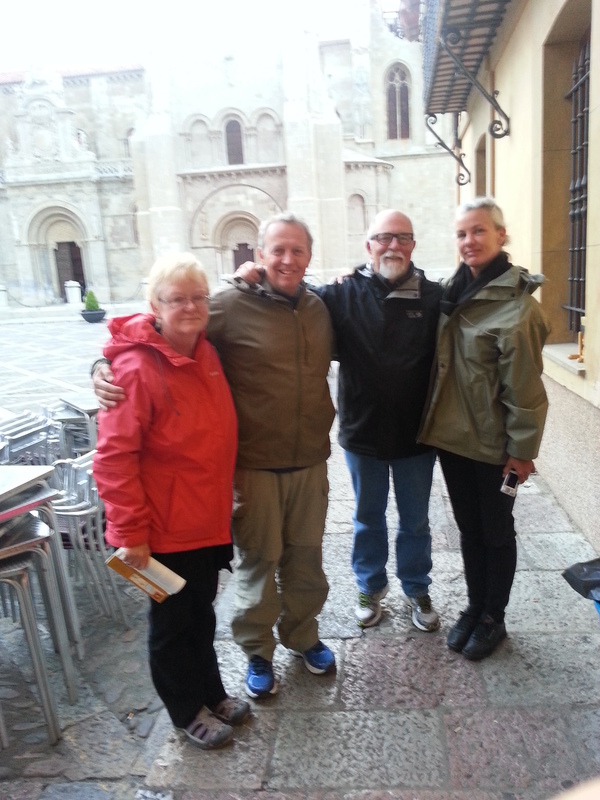 Five minutes later they arrived, but there was an additional person: Brian, Sandy’s husband had surprised her by flying into Leon that afternoon and taking a cab to the hotel! It was their 40th wedding anniversary, so a great surprise. We all enjoyed a great dinner and a couple of bottles of good wine. Sandra and her husband Brian. Happy Anniversary!! They were all going to stay in Leon for another day and Brian would walk with them to Santiago. 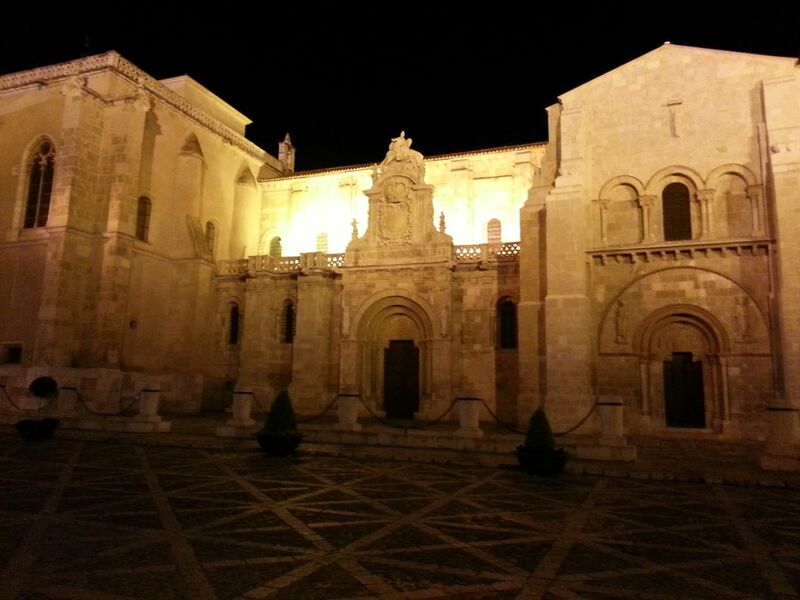 After dinner, we said goodbye outside the restaurant in front of the Basilica de San Isidoro.